Waking up under a ‘canvas’ sheet to the sound of the waves rolling in against the rocks below our cliffside, the sun up already and a day of mountain biking into the unknown ahead of us, we certainly felt no need for a ‘lie in’. Yesterday’s ride up from Cropton to Whitby had stretched the legs but we both awoke in high spirits and eager for Day 2. The route was purposefully designed so that we would ‘camp down’ and more importantly ‘roll out’ from a significant town; with amenities! 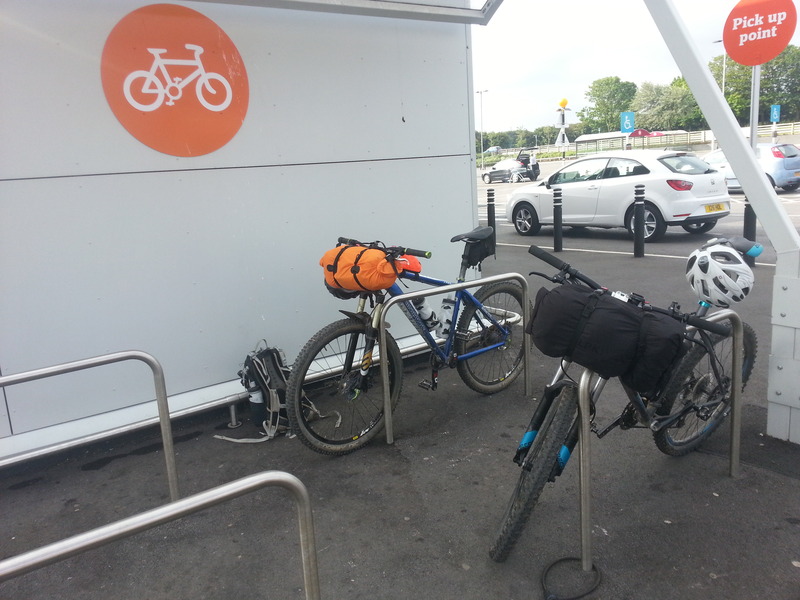 So once the camping kit had been packed away into dry bags and strung up on the handlebars we set off for the local Sainsbury’s. OK, so it’s not exactly what you might call ‘making our way in the wilderness’ or self-sufficiency’ but it allowed us to travel light and focus on the riding and exploring. So Sainsbury’s became our stop for replenishing our water supplies, stocking up on food for the day ahead and of course we took advantage of the ‘facilities’! After our supply stop we had a date with breakfast and this was fulfilled at the van in the layby across the road. A top quality bacon & egg bap each and a much needed coffee to clear the head and we were off on our way. From Whitby we rode out on the B1410 through Ruswarp and then at the end of the road we carried on up a bridleway that took us to Grosmont. 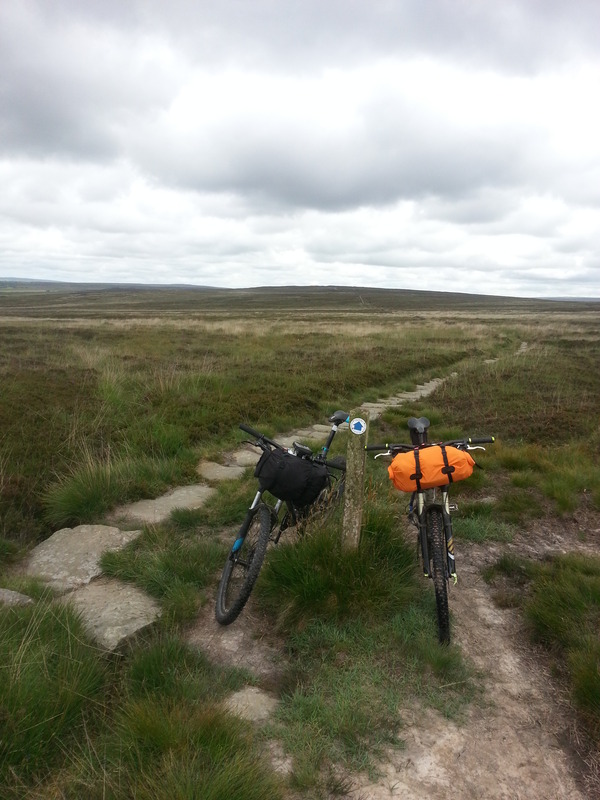 These initial bridleways out of the Whitby area were a huge contrast to the moor tops ones we rode on Day 1, we encountered cows and grassy fields, muddy patches and tractors instead of heather and grouse. There are always less exciting parts of any ride and this first part fulfilled that need; trudging through the long grass at the side of a farmers field is something you do in order to lead into a better section. Those better sections came in the way of short blasts through wooded areas on our way to Grosmont and these were enjoyable but the best wooded riding of the day came later as we headed through East Arncliff Wood. This bridleway must be part of the coast to coast route as it seems that every walker we passed asked us if that was what we were doing. Of course we weren’t, but being a popular route does have it advantages and in this case it’s the flagstones that have been laid to keep the trail accessible. It rained that morning though and the stones were pretty damp, which made finding suitable grip under the tyres a challenge. On one particular descent we stopped at the top and pondered whether to ride down or walk down, I took the lead and decided to give it a go. Rolling off the edge I became aware that it would be one of those mountain biking occasions where I knew I wouldn’t have full control and sure enough I picked up more speed than I’d have liked. So bouncing my way down over the very uneven stones, squeezing the brakes as much as I dare to scrub off some speed but without locking up either wheel, I pointed MuddyGoose in the right general direction and actually reached the bottom in one piece. It was a hairy moment composed of 1 part bravery, 1 part stupidity, 1 part luck and maybe at least a good pinch of bike skills. As well as the wooded sections and the grassy fields we also rode some minor roads and tracks the morning of that second day. Grosmont was connected to Egton Bridge by a track that closely followed the River Esk and from Glaisdale we took the road up Limber Hill. We then promptly took the road back down Limber Hill having determined that we were heading the wrong way; it seems my map reading isn’t always perfect. Then heading the correct way out of Glaisdale we picked up a track past Rake Farm up to Lealholm Side. It was part way along here where my bravado won me a soaking pair of shoes and very wet socks; as Malcolm took the sensible footbridge option I chose to attempt the deep & fast flowing ford, I’ll say no more. From Lealholm, the height gained brought us back up into moorland territory and we crossed Lealholm moor to reach Danby Beacon. It was quite a cloudy day and as we rode up to the beacon, just the two of us and looked out across the moor you could really get a feel for how bleak it would be up there in winter or in particularly bad weather. We rode off the top with lunchtime upon us and whether it was hunger or just the downward gradient of the road, either way we made very fast progress in reaching the village of Danby. Our planned lunch stop. Following a suitable amount for lunch and a chance to wring out my socks we set off on our final section that would take us into Guisborough Forest. From Danby we took the road through to Castleton where there are some public toilets, if you don’t mind a bit of dirt and a decent stench, and then headed up the road to Moorsholm Moor. Afterwards looking back at the map I realised that I had planned to join Danby and Castleton by riding the bridleway through Danby Park but we missed out on that one, which is a pity. The final bridleway of the day that forks off the road towards Guisborough starts off as fairly nice, relatively flat moorland singletrack, then suddenly morphs into jarring flagstones and then after branching left again becomes really fun, weaving, pick your way through, up and down but mostly down singletrack. The kind where you have to time your pedaling as to avoid catching one of the larger rocks or the edge of a particularly deep rut. 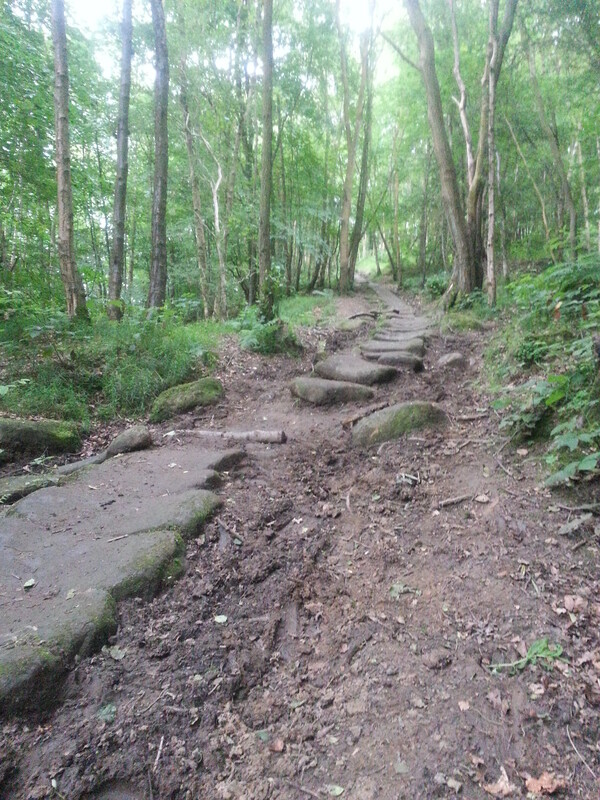 This section was definitely a candidate for ‘trail of the day’ along with the wooded parts leading to Glaisdale. And that was the riding for Day 2 complete. Well, not quite; we still had the small task of finding food down in Guisborough town and then cycling back up through the forest to pitch up for the night. 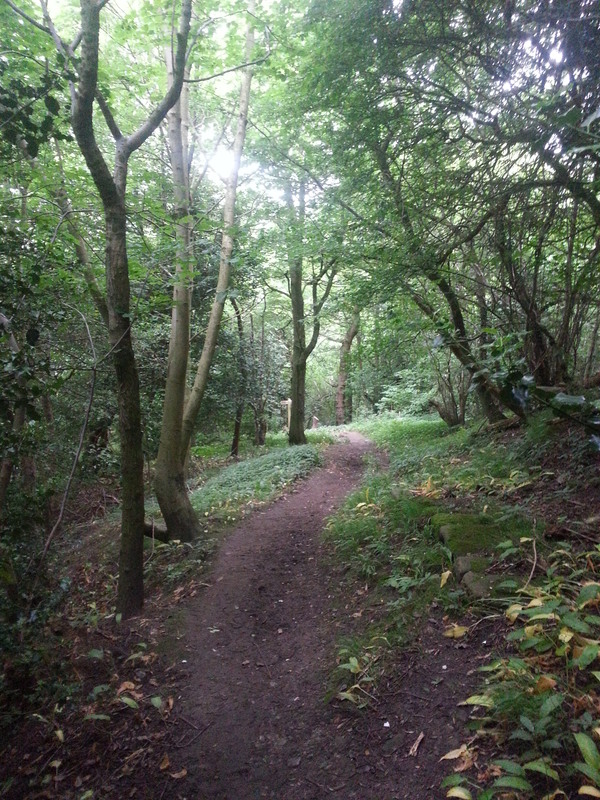 Now anyone who’s familiar with Guisborough will know that the forest is somewhat stuck onto a hillside, meaning that cycling back up when your legs are 60 km emptier and your belly’s a 10″ pizza fuller is not the easiest evening task. But when you have to do it, you just do it and we soon found ourselves back at the top of the forest setting up for the night. 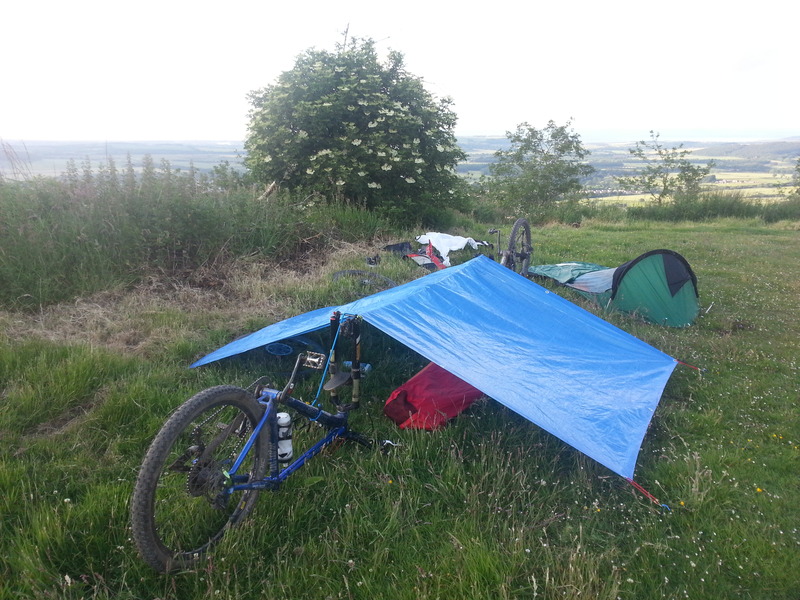 This time we camped on top of High Cliff Nab and being a popular location for walkers, joggers and of course mountain bikers we had plenty of people pass by. The first, a mountain biker in fact commented on what a great spot we’d chosen and we didn’t have anyone even hint at the fact that we shouldn’t actually be there; which was a relief. So with Day 3 of our journey approaching, we enjoyed a bottle of ale picked up earlier from the town and watched the sun go down over Guisborough and Day 2.